That was just plain mean! Yes you are selected to get a code! NO you are NOT ! What the heck U2.com????? Like many of you, I've been a member of U2s fan club since Propaganda days.... I never expected tickets, I just expected to be able to be given the chance to get them. Now not even remotely true. I have loved the music of U2 and I try not to judge U2 by its fan club, but this is really messed up. 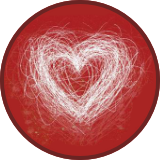 If I only go ONE email saying I wasnt choosen, well that would have hurt, but have been much better that telling me I was chosen, only to then have the rug pulled out from under me. That was just plain mean spirited. And for that reason I am truly disappointed in U2. I came to MSG for NYC7 without a ticket knowing that my chances of getting a ticket were slim to none. What I did not expect was to be harassed and by a MSG security guard and shoved to the ground by a ticket scalper... This is MY story.... I arrived at MSG around noon on July 30, 2015. I went thru the security screening and up to the box office to check if there were any tickets available for the show that night. The box office gentleman was very forthcoming and said that there were not any tickets available at that time, but that there was a ticket cancelation line outside I should wait in and to come back around 3pm for that line and if there were tickets released they would take people from that line. I kept checking the kiosks as well. Around this time I noticed that they were setting up the t-shirt booths and inquired about when the city shirt was going to come out, they said around 2.3--3pm. I spoke to a MSG security guard ( nice older man, dont remember his name) and he was very helpful and also told us about the cancelation line outside. I was talking to a few new U2 friends who were also looking for tickets. We were hanging out around the box office area to the right towards the entrance. We went outside to look for the ticket cancelation line and met Michael I. , a MSG security guard. We politely asked where the line was and he snapped at me and said that tickets were wold out and that there was no cancelation line. I told him another guard and the box office said otherwise. He called me a liar and demanded I leave MSG property. I went back to the box office and he followed me. I spoke to the box office agent and they told me the same thing about the cancelation line. Michael I. then kept on following me around and trying to get me to leave. At one point he said that this was "his house" and that I wasnt going to be allowed to get a ticket. I laughed at him and said he had no right to do that. I was still in the box office area. THey finally got the MSG shirts and I was waiting in the line. Michael I. came up to me and said, "Ive told you 5 times to leave this area, this is private property, do i need to call the police to remove you?" At this point I was very upset and frustrated and I shouted at him multiple times, STOP HARASSING ME !!! He came close and again said that he was going to call to the police. I said, please DO, I'd like to file a harassment report on you!!! He walked away and left me alone. After I got my shirt I went outside and saw people lining up, so I got in line, I was #3 and there were quite a few people lingering around not really in a line. MSG security kept telling us to move back, move back.... Some of us did, others did not. We asked if we could be in a safer place. MSG security ignored our requests. After about 3 times of making us move back the line kind of got jumbled up and people that were lingering were now pushing their way in. All of a sudden for some reason ( I did not hear what was said), everyone bolted for the gated area about 100-150 feet away. ( Actually it was were we started!). I did not know what was going on. All I knew was that someone shoved me aside to the ground, and someone else climbed over me. I looked up and say the MSG guards grinning. I got up and every one was in the gated area. I went to the security guards and said, "What was that? You knew I was #3 in line and all of a sudden there are now over 20 people I need to get behind?" They said, "Sorry you have to get at the end of the line" I had a scrapped knee and mostly a bruised ego. I was so upset that I left the area, went across the street to McDonalds for a Happy Meal. Yes, a Happy Meal. I need to be cheered up my a Minion. After I collected myself, I went back to the venue. I went into the box office area and there was Michael I. again shouting for me to leave. I had a question for the box office and he followed me there saying again he was going to call the NYPD on me. Again, I asked him to please do so. 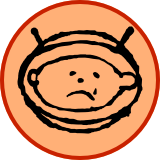 I went back to the cancelation line and saw a U2 friend there still waiting. I was able to purchase a ticket last minute from a friend and I was able to get into the show. It was an amazing show. I posted on Facebook "So I was trampled in the ticket cancelation line. I think security is working with scalpers. Was physically shoved to the ground. I give up. It's not worth it. I have NEVER seen such madness." I tweeted to multiple people/ organizations. I sent a direct message via Twitter to LiveNation, they were the only ones to respond. There response was to elevate it at the venue. I DM them back saying, "no way, MSG could care less about the safety of people" I thought social media would make a difference....Little did I know that it would get worse the next day...... However in the end, it is all about U2. I enjoyed the show. Amazing as usual. I had a ticket for the next night, so I did not need to be a part of that madness. In closing, I will NEVER again, I say NEVER again attend a show at MSG. Looking to purchase a ticket at face value... prefer GA, but will buy any ticket under $200 at face value only!!! [MOD EDIT: Please no phone numbers. Use PMs. Thanks] I'll be at the @U2 event tonight!!! P L E A S E ! ! ! ! My U2 Family ! Deb Wearing LEMON ! 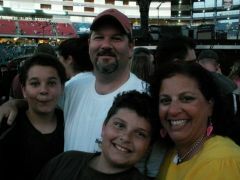 11 year old Spencer's FIRST ROCK CONCERT ! 13 year old Stewart THIRD time seeing U2 ! 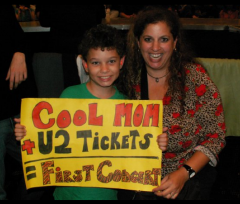 It was an honor for me to take my 9-year-old son to his first Rock & Roll concert ever! 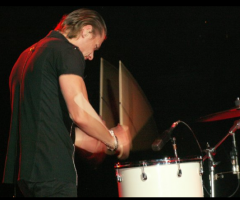 To begin his concert going career with floor seats at a U2 gig was the ultimate! We were inside the ellipse (thanks to MSG security) right near Larry's portable drum kit. I have been to numerous U2 gigs, but this by far was the best show I have seen to date. I don’t know if it was the fact that U2 was excited to be in NYC, or that I was excited to be sharing this time with my son at such a great event. The light show was electrifying. The sound was amazing. I was so excited to hear Fast Cars and Original of the Species. What a great surprise to have Mary J Blige singing with Bono. I don’t think anyone else should be allowed to sing that song besides Bono and MaryJ. Amazing is all I can say. My son Stewart thanks the kind U2 staff who gave him Larry's Drumsticks after Sunday Bloody Sunday. 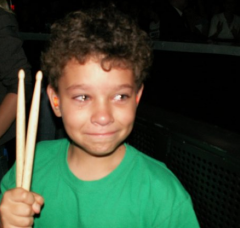 It is a moment that brought a 9-year-old huge U2 fan to tears, as you can see in the photo! 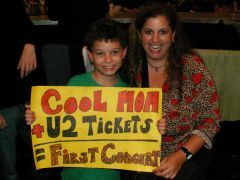 Both mother and son have bonded during this experience, and my thanks to U2 for giving us common ground and music that will span generations! !